BBC bosses were right to fear The Great British Bake Off clashing with the Rio Olympics, after the former scored record ratings last night that beat even the Olympics’ most-watched moments. It seems the BBC bosses were right to fear The Great British Bake Off clashing with the Rio Olympics, after the former scored record ratings last night (August 24). While the baking competition is usually broadcast near the beginning of August, the new series was pushed back to accommodate the coverage of the Olympics. Last night’s opener scored the Bake Off‘s best ever ratings for a first episode, with a whopping 10.4 million average. Between 8pm and 9pm, nearly half (47.5%) of all Brits watching television were tuned into BBC One’s twee baking competition. The episode peaked at 8.50pm as Paul Hollywood and Mary Berry were judging the spectacular desserts with an astonishing 11.2 million viewers. This is more than the most-watched moment of the Rio Olympics, when 11.1 million tuned in to see Laura Trott receive her gold medal for the omnium. The same figure later watched her fiancé Jason Kenny win the men’s keirin. 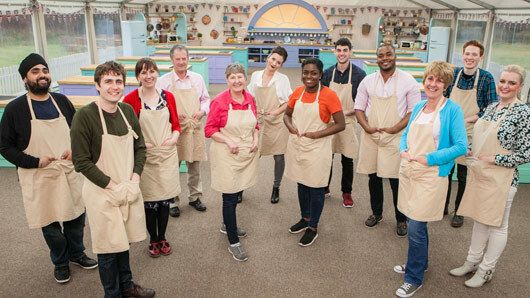 Twelve new bakers entered the Bake Off tent in the episode, tasked with making drizzle cakes, Jaffa cakes and genoise sponges with mirror icing. There were disasters, there were tears, and there was even some reluctant smiling from Paul Hollywood in a delightful episode that reminded fans what the show is all about. Garden designer Jane Beedle was crowned star baker, while church minister Lee Banfield was the first to leave the series. The Great British Bake Off airs Wednesdays at 8pm on BBC One.